Taking it back to ’97 bumping Mystikal’s Unpredictable album while i watch the Pacers and Bulls game on mute. This albums brings back some real memories of these same songs blasting out a cheap boombox in the late 90s while i clean my air forces with a toothbrush on a school night. This was a key album in the collection back then along with the Hot Boys of course. 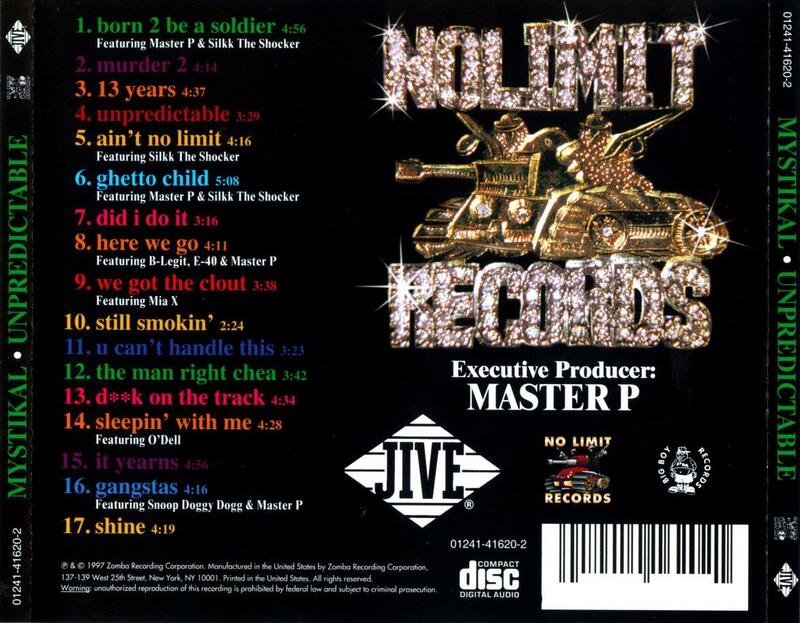 We had plenty of cash money records but this may have been the only no limit album that we had purchased. The production was on point whoever did it and Mystikal was on another level as an artist according to me and my brother back then. No one I knew was listening to this album, most was on that Ghetto D and rightfully so, that Make Em Say Ungh was so tough (na na na naaa!!). Remember who had the best verse though. Mystikal! Sitting atop the rim like a young Vince Carter or something. Unpredictable was a banger. Over 15 years later, my head is still bouncing yelling “HERE I GO!! !” during the classic ‘the man right chea’ and my shoulders still grooving to ‘d**k on the track’ and that crazy beat. ‘U cant handle this’ sounded more like a freestyle but had a chorus full of curse words (literally every word is a curse word lol) and of course its one of my favorite jammies. He even shouts out Hacksaw Jim Duggin. whats up jim. ‘ghetto child’ always got skipped because P was randomly yelling UNNNGH for no reason. Not a bad track but he was annoying on it. Who could forget the beautiful track about his sister ‘shine’? that track got plenty burn from me, his love was apparent in every word. If you havent heard this album, check it out. Its a personal classic to me and in my opinion, his best album.